I'm not new to sim but I made a long pause and it seems things have changed. I wanted to train a bit with very simple flights, what's more simple for a french pilot than training between LFPG and LFML (CDG & Marseille) ? 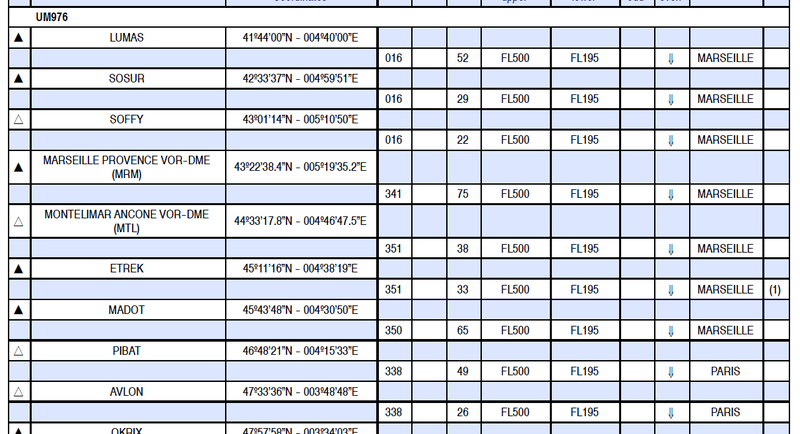 I just noticed VOR-DME ATN (Autun) was located there in the past. I do not know if it was recently replaced with WP PIBAT. Dest. LS**, LFGJ/LB/LI/LJ/LP/SD, as our destination is LFML, we aren't allowed to use this routing. This second (RAD) error is generated by EUROCONTROL, which means that the routing isn't allowed in real life. You'll have to use one of the other routes given for this pairing, either LATRA UM133 LERGA or MONOT R161 NEV R31 MTL, depending on your projected Flight Level. It took me some time to understand, but I think I got what you mean. Your view is that of real life ; in real life the FP is wrong, because of all constraints, if my understanding is correct PILUL departure is reserved for specific dest LS.. and traffic to Provence shoul be routed over DJL. That's your point and in a next future I will comply to that. My point was in the simulated world ; I'm training on the Wilco Feelthere single aisle Airbusses (Volume 1) just to get experienced with flying them before flying again live on Vatsim. In this case the used airac is the last one and it seems waipoint PIBAT is not implemented in the airac delivered by Navigraph. There is no Eurocontrol Check in the simulated world. and going on with NINIS, MADOT, ETREK ending with MTL. Looking at coordinates VOR-DME ATN, in Navigraph, has the very same definition as WP PIBAT in real life. And that is MY point. ATN should no longer appear in FMS Databases, it should be replaced with WP PIBAT. Of course after beieng familiar with flying Wilco Airbii, I will fly live on Vatsim with verified P/P, but it's the next story. In any case thank you for your response, it let me feel new constraints in building realistic F/Ps. I was occupied the last few days so didn't have time to reply to your post, but in the latest Airac from Navigraph (1101), PIBAT is most definetly there and is part of both UM975 and UM976. If your navdata is telling you otherwise then it may be corrupted, in wich case it may be wise to re-download. Te new route will in coming days be available for vroute users. What did change since last week ? Probably a change in the RADs as there is a new Airac out. Haven't had chance to look as yet, a little busy on a refresher course.